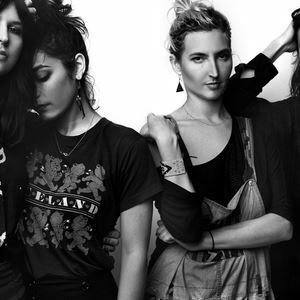 Warpaint is a psychedelic rock band which formed in 2004 in Los Angeles, California, United States. The band consists of Theresa Wayman (vocals, guitar), Emily Kokal (vocals, guitar), Jenny Lee Lindberg (vocals, bass), and Stella Mozgawa (drums). The band's original drummer, Shannyn Sossamon, left the band in 2008. The band had multiple temporary drummers until Mozgawa joined in 2009. As early as 2011, drummer Stella Mozgawa, in an interview with NME, expressed the band's intention to "experiment and write with one another" as the current line-up had never composed songs "from the ground up" together. Bassist Jenny Lee Lindberg further indicated that most of the newer songs were written by "just jam[ming] and free-flow[ing] onstage".